We are honored to represent the work of Dusty Pendleton, of Bandera, TX. September 29-30, 2018, at the Duncan-McAshan Gallery. ​the Hill Country Arts Foundation. 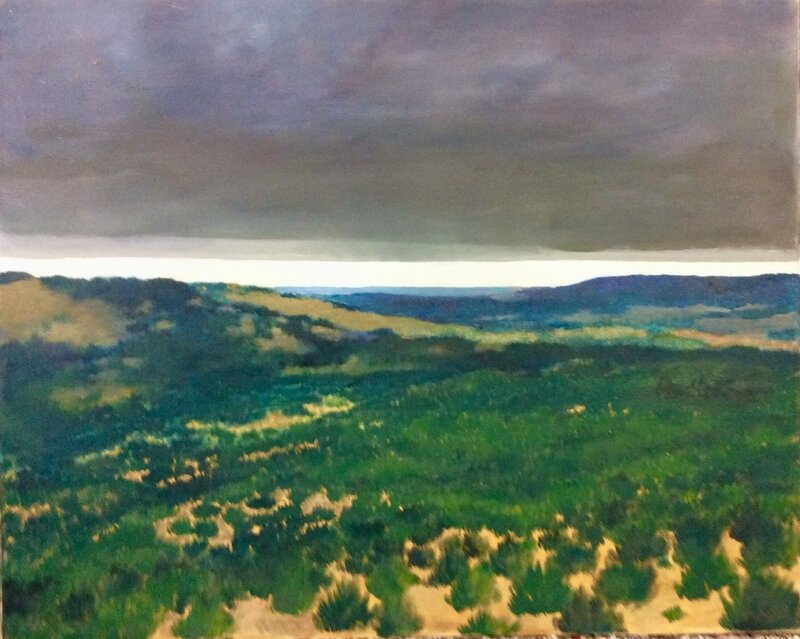 Dusty Pendleton began painting the Texas Hill Country landscapes upon his return from years of painting and exhibiting in several European countries as well as in Mexico. In his paintings, he lets "nature speak," creating studies of hills and rivers, of skies and houses, and the juxtaposition of the land and the human figure. He also works with the presentation of light at various times of the day, noting the differences in light and color between morning, midday, and dusk. There is certainly a sense of history being captured in these landscapes but it strikes me as more metaphoric than programmatic. Unlike some painters, Pendleton does not sentimentalize the contemporary impulse to divide and conquer the land. Rather, he uses the hill country’s wild and raw elements to interrogate a clichéd vocabulary of the past. There are no cowboys on horseback or Native Americans staring at vistas; no quaint fields of bluebonnets or maidens in chiffon dresses. Instead he invites the viewers in media res, into a narrative that remains indeterminate, requiring extended contemplation to complete. Herein is the power of his painting: it evokes the sense of mystery which is inextricable from beauty itself and reminds us that those seeking to conquer nature are doomed to be conquered by the impulse while those seeking harmony with the ineffable find it in the smallest details of his landscapes. We are pleased to represent Dusty Pendleton. by the Texas Arts & Crafts Foundation. to take in the beauty of his work.